Find you new home at Regency Holmdel, an active adult community. Regency @ Holmdel is an upscale active adult community, built by a highly regarded national builder of luxury homes. When construction is completed there will be 185 adult community homes. Due to it’s location in Holmdel, it’s close to transportation, shopping, fine dining and of course, The Jersey Shore. There are also some detached, single family homes in a sister development, Reserve at Holmdel. However, these detached homes are not age restricted. When shopping for new construction,you should be accompanied by a Realtor who is experienced in new construction. When you visit a new construction sales office the salesperson in the sales office works for the developer. That person does not work for you. We have saved many of our clients thousands when they purchased new construction, and we may be able to help you also. And the best part? The developer pays our fees – it costs you nothing to have us accompany you. The carriage homes in Regency at Holmdel are all attached to other homes, with either two, three or four homes per building. The homes have three bedrooms, 2.5 baths in addition to attached two car garages. These homes have between 2,658 to 3,357 square feet. Prices begin in the mid $700,000s. These elegant homes have first floor master suites, formal dining rooms and two story foyers. Additionally you’ll find open floor plans, granite counter tops in the kitchen and – wee, I think you get the idea. This is the social hub of Regency at Holmdel. Inside, you’ll find a gathering room, a card room and a fitness center. When the weather is warm, you’ll find a heated outdoor pool, tennis and bocci courts and more. There is shopping and dining in abundance in the area. And Sandy Hook and the Jersey Shore are just minutes away. Live theater and music are available in Red Bank or the PNC Art Center. Nearby you can pursue hobbies such as fishing, boating and golf. You’ll find this is a great place to live! For those who still commute, train service from New Jersey Transit to New York is available at the Middletown station. Also, the Sea Streak Ferry is a short ride away. 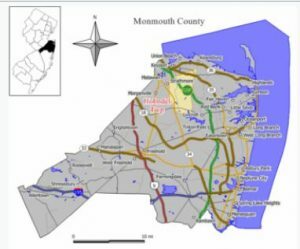 Would you like to learn about other Monmouth County new construction? Would you rather look for a condo in Holmdel?